Promoted by Hetero Group, Hetero Windpower Limited was incorporated in 2010 with the objective of setting up windpower generation projects across India. The company aims to establish 500 MW capacity wind farms in next 5 years and plans to increase the capacity to 1000 MW by 2017. Hetero Windpower is promoted by Hetero Group, a pioneering player in domains such as Pharmaceuticals, drug discovery, logistics, infrastructure development, housing constructions, education and other areas of businesses. Team that has seen the World? Hetero Windpower has rich domain experts onboard who mentor the processes involved in analysis, planning, execution, commissioning, support, etc. 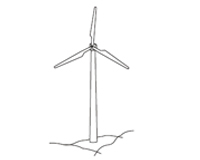 At Hetero Windpower, we emphasize on continuously exploring wind farms across Andhra Pradesh and other parts of India.